Secondly, after the previous library called 'GAIA', it seemed to me that this tittle and the type of sounds and concepts that it provides would bring the whole thing to a cohesive ensemble. Last but not least, as i've always been a fan of space science fiction films and also astrophysics/space exploration, Interstellar soundset was the perfect opportunity to develop a full palette of sonic space ambiences, SFX and deep drones, aliens sounds, robotic vocals, cinematic pulses, dreamy and spiritual textures, and ethereal angelic voices of the cosmos. 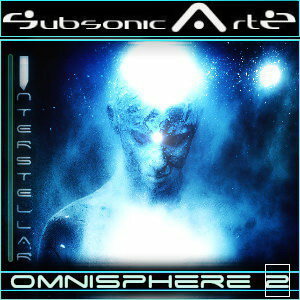 - There are 154 patches in OMNISPHERE – INTERSTELLAR. - You'll need the version 2.2.0g (or above) of Omnisphere 2 to be able to install the set and use it. The library will NOT RUN IN OMNISPHERE 1 .!! THE PATCHES: 7 IR (Impacts and Rythms) , 32 IFXN (Interstellar Special Fx and Noises) , 3 Keyboards, 28 Pads, 33 Pulses, 36 TXT (Textures), 15 vocals/voices pads. - The modwheel has an action on every patch for subtle or drastic changes on the sounds.